At the begin of 1951, together with the companies Diamond T and International Harvester, the Mack was involved in a production of the standardized 5-ton army M54 series truck (6x6). The first trucks of all three manufacturers practically did not differ from each other, but the Mack made especially specialized vehicles: M51 dump trucks with rear unloading, long wheelbase M46 and M78 trucks to transport missiles and it's parts, heavy wreckers, trucks with special bodies, and the chassis M139 with a wheelbase of 5460 mm used as the 60-ton vehicle-launched bridge M328, also served to transport the pontoons and light landing crafts. Since 1958 the updated chassis M139D was used as the launcher M289 for the Honest John surface-to-surface missiles. All the trucks were equipped with the gasoline-powered Continental R6602 engine with output of 190 hp and mechanical 5-speed gearbox Spicer. In 1962, the Company started production of its own range A1, which was included the basic flatbed truck M54A1, dump truck M51A1 and tractor M52A1. 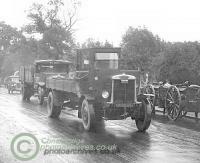 Trucks were equipped with the 6-cylinder diesel Mack ENDT-673 turbo engine (11,0 l, 205 hp) and a new gearbox Spicer . Later on the long wheelbase chassis M63A1 was produced the flatbed truck M78A1 for a delivery of missiles, and on the chassis M139F - truck M386 for service of missile systems adopted by the arming of the Bundeswehr. No idea about author of this page, it makes little historical or factual sense, not researched well and has several errors.. Refer to US Army TM's as proof.